Diana Krall spent the better part of the 2010s exploring byways of American song -- her 2012 set Glad Rag Doll drew heavily on obscure jazz from the 1920s and '30s, its 2015 sequel Wallflower concentrated on pop and rock tunes -- but 2017's Turn Up the Quiet finds the pianist/singer returning to well-known standards from the Great American Songbook. Reuniting with producer Tommy LiPuma for the first time since 2009's bossa nova-inspired Quiet Nights, Krall works with a trio of lineups on Turn Up the Quiet, alternating between a trio, quartet, and quintet. The album isn't divided into triads but rather gently shifts between these bands, a move that's sometimes imperceptible because the focus is firmly on Krall, the pianist. Her voice often operates at a hushed whisper -- a decision that suits this collection of romantic, dreamy material; it also underscores the importance of the record's title -- and that emphasizes her lithe piano along with the solo spotlights from her featured musicians. Krall gives her three bands plenty of space to shine -- fiddler Stuart Duncan, in particular, stuns with his solo on "I'll See You in My Dreams," but there are nice turns from guitarists Russell Malone, Anthony Wilson, and Marc Ribot, along with supple playing by bassists Christian McBride, Tony Garnier, and Anthony Wilson -- but what impresses is how these ensembles are all united in spirit and attitude, all thanks to their leader. Krall has a definite vision for Turn Up the Quiet -- she wants to keep things smoky and subdued, a record for the wee hours -- and the end result is so elegant, it seems effortless. It’s a photo finish as to whether the title of The Most Tasteful Jazz Trio belongs to Kenny Barron or Bill Charlap. This latest album by Charlap’s team of Kenny Washington/dr and Peter Washington/b sure make a good argument for the trophy. Charlap is in gorgeously lyrical form, and the Washington’s supply deft support whether the jump right in for the fun “Bon Ami” or wait until the last moment before gliding down the staircase for a reflective “Sophisticated Lady.” The mix of soft brushes, patient bass pulse and warm catcher’s mitt hands make for deft handling of pieces like “Spring Can Hang You Up the Most” and “There’s A Small Hotel.” Like all great cooks, Charlap trusts the basic ingredients of the materials, never feeling a need to add too much spice to kill the basic taste. Excellent! 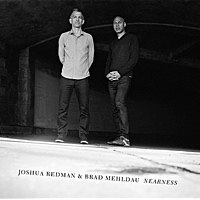 Brilliant musicians don't always make brilliant music when they collaborate and while that's sometimes been the case with pianist Brad Mehldau and saxophonist Joshua Redman, on the duo concert recordings that make up the appropriately-titled Nearness, they live up to their elevated pedigree. And that's individual as well as shared cachet: Mehldau spent a fair amount of time, some eighteen months to be exact, as a member of Redman's groups in the early Nineties and they formally collaborated on Highway Rider (Nonesuch, 2009). In fact, the two musicians' time together in the same performing unit acts as a catalyst to their well-grounded musical education and their prodigious technical expertise on Charlie Parker's "Ornithology" and the Mehldau original "Old West (one of the three he and his partner contribute to the six here)." The intricacy of their instrumental involvement(s), in particular each man's ability to anticipate the other as they improvise, remains as fluid and authoritative as when they are actually rendering the changes of "The Nearness of Yo u:" in its near seventeen minutes,this tune of Hoagy Carmichael's receives the deepest exploration of (both implied and stated) rhythmic and melodic nuance on the album. Within these poised yet freewheeling interactions, there is never a sense other musicians are missing as might otherwise appear in a larger ensemble i,e., a rhythm section or perhaps a guitarist. Both Redman and Mehldau have that experience to draw upon, the former in his groove-oriented projects Elastic (Warner Bros., 2002) and Momentum(Nonesuch, 2005) and the latter in his studio and live collaborations with guitarist/composer extraordinaire Pat Metheny, so they're fully acquainted with how to play in larger lineups, but this also preps them for smaller more intimate setting such as the one captured on Nearness. Such knowledge of the dichotomy also guides the pianist and saxophonist in knowing what to leave out when they play, whether it's embroidering upon the structure of "Always August" or in the call and response they judiciously partake in during these recordings. Weaving around each other and spiraling up, down and around within Thelonious Monk's "In Walked Bud" only makes the denouement of in their resolution together all that much sweeter when it arrives. All of which speaks to the expertise of the musicianship on display during Nearness, but overlooks a comparable expertise on the production front exhibited by Joshua Redman and Brad Mehldau. Working with performances from July and November of 2011, the discerning ears of recordist and mixer Paul Boothe as well as mastering engineer Greg Calbi insure the maintenance of a sonic quality as sharp as the chemistry of the two artists whose names appear in top billing on the CD package, the black and white design of which belies the multi-colored dynamics of the music enclosed. Ornithology; Always August; In Walked Bud; Melancholy Mode; The Nearness of You; Old West. Joshua Redman: tenor and soprano saxophones; Brad Mehldau: piano. That Antonio Adolfo should be paying homage to the Jazz side of his music should come as no surprise. Like that great Cuban piano master Frank Emilio Flynn, Adolfo’s pianism shows a strong Jazz influence. But more than the fact that he has imbibed the cadence of Jazz it is these arrangements that are so special on Tropical Infinito. They tell of the uniqueness of Adolfo’s genius, which is his ability to tell stories as if he has written them. Few pianists could pounce on these pieces with such joyful momentum. Try Benny Golson’s ‘Killer Joe’ for size. No less intensity marks both meditative lyricism and the agitated outbursts of Horace Silver’s ‘Song for My Father’. Adolfo’s one-beat-to-the-bar treatment of All The Things You Are’ take wing, abetted by clear dynamic and well-shaped imitative writing. Antonio Adolfo is a prodigiously talented pianist and one of Brasil’s great pedagogues. These are important factors in his life as a musician. It has kept his music fresh and energetic; yet at the same time there is erudition to his pianism that enables him to imbue his music with a profundity that often escapes musicians younger than him. His superb articulation (in Oliver Nelson’s ‘Stolen Moments’ of the central ‘andante’s detached chords and cross-rhythmic accentuation underlines his version of the chart to some of the finest ever played. In fact, throughout the CD he delights with a feast of fine playing excellently recorded (by Roger Freret) and his focus on the music never wavers. I’ve long had a soft spot for Antonio Adolfo’s playing. Every record he makes sets a new benchmark on the last recording. It is not just the nobility and imperiousness of his playing, or of these works, or the different narrative tones he is able to bring to each of the songs in question. But he has the phrasing of a great singer captured in moments of incredible emotion. Listen to ‘Whisper Not’ and you’ll see what I mean. It is a rare intégrale in which every work is as technically successful and musically convincing as all its companions. But this is certainly the record when Antonio Adolfo proves that to be true. Moreover all of these tunes evoke a glorious world of Jazz at its most compelling. For that we must praise Antonio Adolfo and his terrific ensemble for an extraordinary performance. Killer Joe; Whisper Not; Cascavel; Yolanda, Yolanda; Stolen Moments; Song for My Father; Partido Leve; All The Things You Are; Luar Da Bahia. Antonio Adolfo: piano and arrangements; Jessé Sadoc: trumpet and flugelhorn (4, 7, 8, 9); Marcelo Martins: tenor saxophone and soprano saxophone (4, 9); Serginho Trombone: trombone; Leo Amuedo: electric guitar; Jorge Helder: double bass; Rafael Barata: drums, percussion; André Siqueira: percussion. Special Guest: Claudio Spiewak: acoustic guitar (1, 3, 8).